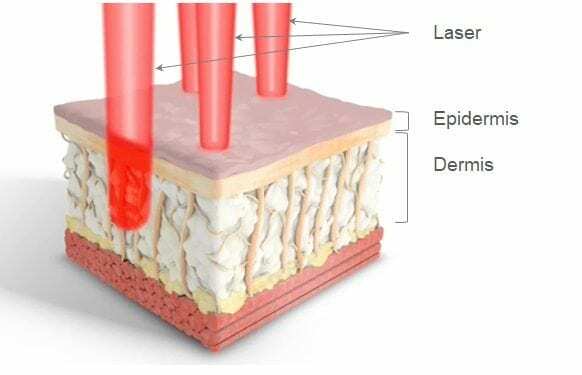 WHAT ARE FRAXEL LASER INDICATIONS? Fraxel is a fraction laser with dual wavelengths that is the golden standard as skin resurfacing treatment. Fraxel laser improves the production of collagen by invigorating the dermis layer and encourages new cell development on the epidermis to smooth out the highest point of the scar and stretch marks. HOW MANY SESSIONS OF FRAXEL LASER DO I NEED? A client has to stopGlycolic acid and Retin-A (topical and oral) at least 1 week before the treatment. The continuation of the treatment depends on the treatment and the response to the Fraxel treatment. Make sure to protect the skin from prolonged sun exposure by using 30+ SPF sunblock or covering the area with clothes. We advise People with a history of cold sore to take a protective antiviral medication course 1 day before the treatment. We advise People with low pain tolerance to apply freezing cream at least a couple of hours before starting the procedure. For people with high pain tolerance, it takes about 15 min for the freezing cream to work efficiently, so please allow enough time by arriving early. Most patients describe the treatment as an expanded vibe of medium to mild heat during the course of the treatment. We apply a special freezing cream for 15 min before the Fraxel treatment to limit the discomfort during the laser treatment. The cooling nozzle integrates the Fraxel Dual handpiece is to reduce pain and make the whole procedure more comfortable. After the treatment, most patients feel like they have a sunburn, which generally reduces in 1 to 3 hours. we advise patients to use cooling methods such as cold compresses on an hourly basis for the first day after treatment. It may help to elevate your head while sleeping by using two pillows on the night after the Fraxel resurfacing laser. Patients might experience worsening in the redness and swelling for the next two or three days after treatment. Some dark spots may appear after treatment and the skin color might change to be bronze. The skin texture might be described as sandpaper and the out layers will start flake and peel too and it will be replaced with a fresh new skin, this is what resurfacing means. The sloughing process starts 3-4 days after the treatment and it might continue for 1-2 weeks after. The severity of the side effect and the length of the healing process mainly depends on the setting used during the treatment. the higher setting produces a more aggressive treatment and longer downtime, but better results. After two weeks, the baby fresh skin might stay rosy pink for more two weeks. Patients are free to use makeup to cover it if they do not like the pink color.